This week’s guest is Karen Chambers, Executive Director, of the Bob Rumball Associations for the Deaf. The Bob Rumball Associations for the Deaf (Bob Rumball) is an organization who’s mission is to build better futures for deaf and deaf blind children and adults with a developmental disability, to help them reach their full potential. Karen has been a part of Bob Rumball for 25 years, and the Executive Director for the last 10 years. The organization has continued to evolve and innovate since its origins in 1960. 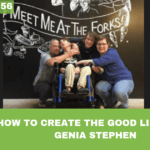 Karen shares that capabilities of the employees, with a disability, has been even greater than most expected. Employees are maintaining the grounds, collecting balls, driving golf carts, and interacting with customers. Employees have left ‘The Range’ and successfully transferred their skills at other workplaces, including local golf courses and a local conference and event centre. It is important to note that employees are paid fairly for the work they perform. Karen also shares a second social enterprise they have started; a community/ therapeutic garden. The gardens is an opportunity to invite people from other organizations and promotes social interaction and the growth of social capital for everyone involved. We also discuss language and communication in this episode. I believe the language we use is very powerful in empowering people, and I learned that the proper terminology is deaf or deaf-blind, not hearing or vision impaired. Karen also provides some great tips on communication with a deaf person if you do not know sign language; use your facial expressions, write your words down, use the ‘Spread the Sign’ App. For tips on starting a social enterprise tune into the podcast episode. Also, this podcast has been transcribed below for the Deaf community. 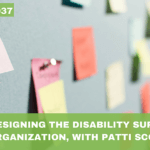 – Learn how social enterprise is empowering growth of individuals with disability, and fostering a more inclusive community. 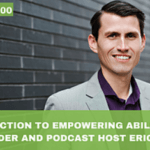 Eric: Hey folks welcome to Episode 7 of the empowering ability podcast. Voiceover: Welcome to the empowering ability podcast where we get you and your loved ones impacted by disability the information needed to live a full and meaningful life. Now here is your host, Eric Goll. Eric: Welcome, welcome, welcome to the empowering lability podcast. This is Episode 7, and today’s guest is Karen chambers from the Bob Rumball Associations for the Deaf, and they’re located in a couple of places; Toronto, Parry Sound, Milton area. They provide services to individuals that are Deaf and or Deaf Blind, and also people that are Deaf or Deaf Blind with some sort of intellectual disability. So Karen and I have a great chat around language and communication – particularly with those individuals that are Deaf or Deaf Blind and how to communicate with them. And in just some of the language to use when referring to an individual that is Deaf and we also talk about the history and the story behind the Bob Rumball Associations for the Deaf and it’s it’s a pretty cool story, so I think you’ll enjoy that. And when we get into social innovation, and some of the projects that the organization is working on. So without further ado here is Karen. Hey Karen. 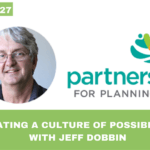 Welcome to the empowering ability podcast. How are you doing today? Karen: I’m great. Thanks for having me Eric. I’m happy to be here. Eric: Yeah, thanks Karen, we’re super grateful that you took the time out of your day to come and chat with us. So we’ve got Karen Chambers the executive director of the Bob Rumball Associations for the Deaf. 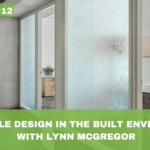 And Karen maybe just to start off here would you be able to tell us a little bit about the history of your organization, and maybe just up to today in terms of the services that you provide for your customers or your clients. Karen: Sure. So our history actually goes way way back to the reverend Bob Rumball who established the Association for the Deaf in 1985 and was doing some other programs. Believe it or not, he gave up his career as an (Toronto) Argonaut to to become an ordained minister and he thought that his calling was in the deaf community and that was really not fair that deaf individuals didn’t have access to to religion. And so it all kind of started in a church basement in downtown Toronto and grew into the Ontario camp for the deaf in Parry Sound and the association in Milton, which is where I am speaking to you from today, and our center in Toronto, and our long term care in Barrie just to name a few things that we have that we have established over the years. So that’s a little bit of the history and where we find ourselves today. It is our mission to build better futures for Deaf and Deaf Blind children and adults with additional needs. So we have services in Toronto and in Halton (Ontario) for individuals who are Deaf or with a developmental disability and we also serve seniors who are Deaf in Toronto and we have an adult education program there as well for newcomers to Canada who have a developmental disability, and some learning disability as well. So here in Milton we also run a children’s mental health program, which is designed to meet the the unique needs of Deaf kids and youth and their families. And it’s a clinic, an outpatient clinic, located on the property of the EC Drury School for the Deaf here in Milton. We additionally run a respite, or some people know it as parent relief, opportunities. Again it’s just an opportunity for deaf individuals to meet up with some of their peers and have a really nice weekend away or good March break. And at the same time providing a break for their caregivers so that in a nutshell is sort of our are funded programs. And then about four years ago we decided to branch off into social enterprise and that is known as The Range which is a driving range located here and Milton as well and the people who work at our range are also the people that we support. So it’s been a really great great opportunity. Eric: Very cool. Very cool. I love that story. You know starting with Reverend Bob Rumball from the Toronto Argos. Yeah it was awesome. And it sounds like you’re reflecting on your history of organization, there’s been a lot of innovation along the way and you continue to innovate with the social enterprise; The Range. So I’m excited to dive into that a little bit deeper with you Karen. Sure. Before we go there just before the podcast here I said hearing impaired and you stop me and you said this hold on a second. Let’s talk about language and language is super super important. So when talking about the Deaf and the Deaf Blind community can you shed a little bit of light on the language that is used with inside of your organization. Karen: Sure. So depending on the individual needs there’s a myriad of different modes of communication. Anything from American Sign Language to signed English to hand over hand, which is used for Deaf Blind individuals where you are actually communicating by touch on the hand. We make language work at whatever level the individual needs to communicate. Most of our staff are Deaf themselves. So we walk into work in the morning and we turn our voices off for the most part except for an occasion like this one I’m talking to you. We turn our voices off and we communicate an American Sign Language. For the most part it’s very much a culture along with the language that we embrace here. Eric: Okay that helps. So as an individual that doesn’t have doesn’t speak American Sign Language or hand over hand, what are some simple tools or tips that I can carry around with me when communicating with someone that’s Deaf. Karen: So believe it or not in the world of technology there’s a an app. It’s called Spread the Sign, and you can actually just type and type in a word and it will give you the sign that you would use. Alternately, you know most of most of the communication between a Deaf individual or two Deaf individuals is through facial expression and body language and the sign is you know to complement that of course. So I would say be as expressive as you possibly can. And writing notes always works as well. And I would say don’t shy away because of the communication barrier any Deaf people that I have met are very much just happy that you would want to interact. Eric: That’s super helpful and you also serve individuals that are Deaf Blind. So in terms of communication with those individuals, do you have any tips on that? 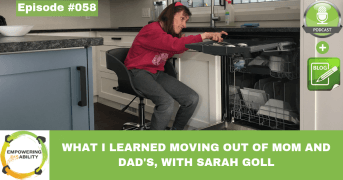 Karen: Well typically if you were to meet a Deaf Blind individual in the community they would be accompanied by an intervenor and that intervenor is a support person who pretty much really navigates the environment for the Deaf Blind individual. So you would communicate with that person through their intervenor. Eric: Okay great. Great. That’s awesome. I think that that will help our listeners of this podcast to communicate or improve their communication with individuals that they encounter or in their life that are Deaf or Deaf Blind. So thank you for that. So let’s dive into the Social Innovation piece and there’s a couple of things that you’re working on in this space particularly with the social enterprise side of it. So I’d love maybe if you could start us to tell us about the range and the ranges of particular interest to me because I’ve actually been to the driving range but the driving range that we’re going to talk about when I was in high school says five 15 years ago but it’s probably changed a lot since then so I’m excited to hear what’s gone on so. So can you tell us about the range? Karen: Sure so. So I I’ve been in this position for approximately 10 years. And the range is on the proper is on property that’s owned by the Ontario Mission of the Deaf. And there were some business owners that had rented the property and set up their business there which was the driving range that you would have golfed at Eric. Many many moons ago. And, you know, I watched them for a number of years run this business. And I thought to myself you know this is property of the Mission of the Deaf, and I’d really like to see my guys benefit from this. So the business was essentially bought out. You know if for for actually a very low price because we had the property to begin with. So we’re very fortunate about that. And we started the social enterprise aspect of it in 2013. So this is our fourth fourth season. We’re just actually we just opened up last week and have a really busy weekend because the weather is so nice and those diehard golfers are dying to get back at it. So yeah we we opened up in 2013 and we didn’t miss a beat between seasons so nobody really knew until they came in that the business had changed hands if you will. In our first year, we employed 12 individuals at the driving range and they would do anything from, you know, running the cash to driving the golf cart and picking up balls and washing balls and keeping the greens nice and beautiful. Basically anything that we can do to train the people that we support in transferable skills that they can then, if they don’t want to work at a driving range forever, they can find other opportunities in the in the community to work at or volunteer. But I mean our goal is really let’s find you a job and we do. You know there’s been this whole movement in developmental services around closing sheltered workshops and I remember when the assistant deputy minister came out for a visit to see the driving range a couple of summers ago and she said to me “and what you pay your staff?” and I said “minimum wage and the staff are our clients’ – the people that we support. And she said “right answer”. Because if you’ve been following along, which I’m sure most people have with the sheltered workshops, there was just wasn’t really a fair pay for employment. Eric: All right so you’re paying them a fair wage for the work that they’re doing. Karen: So that’s sort of in a nutshell what we’ve been doing for the past four seasons and it’s been just an exceptional thing to watch. We honestly, you know, Eric for a long time I’ve been I’ve been around for 25 years in this business and my current role for 10, but you know, for a very long time we just ran community homes and we had nice little arts and crafts and little activities and things on the side for our clients to participate in. But there was never really a huge focus on individual’s abilities and that’s what we’ve learned over the last number of years is let’s stop looking at what people can’t do and look at what people can do. And it is unbelievably shocking when I see some of the people that have been with us because we’re very much a family based organization, we’re a community within a community, referring to the Deaf community. And so some of my clients have been around for as long as I have, and to see them grow and see this opportunity, and to see the pride and the joy on their faces when they put on their Range staff T-shirts. I have to tell you I was very very nervous the first time I saw one of our one of our guys driving the golf cart. We have a pond on the property and you know all these horrible things were going through my mind of what could happen. And once you get past that you just can’t help but smile when you see when you see the benefits of something like this. Eric: Yeah I love it. Are there any examples that come to mind that you are able to share where an individual was being looked at for there deficits, and once they started working at the range their abilities started to show up and really come out? Do you have any examples or stories that come to mind that you’d be able to share? Karen: Well yeah actually, there’s a few of them. Again you just think about how are they ever going to get employed anywhere you know because it’s all about production, or time is money, and maybe our guys don’t work maybe quite as fast as anybody else does. But the quality is there. And so you know one of the gentlemen that we supported through The Range actually ended up working at a golf course just down the street and finding employment there. Another gentleman he has now got a job at a local catering company an event venue. So and these have been sustainable jobs. And so the customer service element that that these gentlemen have learned, again the transferable skills the expectations when you come in it’s very much these guys applied for these jobs. They weren’t just handed the jobs. They had to go through an interview process, they had to develop a resume, obviously with any assistance that we can provide develop a resume and and interview for the job. And the best candidate gets the job and we have along with our own clients. We’ve also supported people from other community living organizations as well in terms of job training and providing work. So it’s been it’s been really an awesome adventure. And we also have people who, I mean it’s a lovely property here, so we have people who come and they will volunteer and maybe it’s you know raking raking the greens or planting some flowers that kind of thing. It’s just actually just the environment itself is very therapeutic it’s quite lovely and relaxing and nurturing. Eric: Very cool. And so that really brings home that the 12 individuals working there are learning transferable skills and I’m sure confidence is a piece of that to be able to go get jobs at other employers, right. Like you mentioned at another golf course and whatnot so that’s fantastic. Karen: One of our guys originally is from New Brunswick, and because our services are so unique he came here us as a kid and has grown up with us and he worked at The Range and he actually earned some money put the money away and he was able to fly home independently. He went home to visit his mom around Christmas time. That was quite an awesome reunion because she had not seen him in quite some time, and due to many circumstances, and he could save up the money that he earned through working and use the skills that he had acquired to catch a flight home to New Brunswick. So that was a joyful moment for all of us as well. And a little nervous too, you know, making sure we heard he was on the plane safe, and that we heard he met up safely with his mom -and I got a little nervous but a very happy ending. Eric: Yeah, I love that and you have to live a little bit on on the edge too to have that growth, right. If an individual sitting in their comfort zone all the time then typically were we’re not growing. So to you know jump on a first flight alone is a challenging thing for anyone and I’m sure you add in an individual that has is Deaf or Deaf Blind it adds another component into it. Yeah. So yeah I love that and building on that confidence right that they’re getting with with with employment. It’s fantastic. And so I’m sure within the Bob Rumball Association for the Deaf when this idea first came out, hey let’s turn this driving range into a social enterprise, was probably met with a bit of resistance from some people within the organization. What are some of the things that you did or the organization did to make this a smooth transition and make this thing happen? Karen: Well you know you got to seize the opportunity when it comes along. Right. And I saw the opportunity and I saw the great thing that was happening next door that we weren’t a part of and it was on our very own property. You know like I said, it was fairly modest financial investment. And there are risks attached to it, but we also have a director a golf director who happens to live across the street from us ,and he has been truly a godsend. We really couldn’t do it, couldn’t have done it without him. He has embraced every one of his employees. He works tirelessly. I don’t think you could ever pay someone like that enough to do what he does. He’s such a mentor role model. He really has made The Range of what it is. So finding those key people again, you know, I think I did mention the stars aligned for us. It was just such a great opportunity at the right time with the right people and we were just very very fortunate that everything worked out. And I think that from my board’s perspective of course risk management is a big part of my job, and you want to make sure that you’ve got a solid business case moving forward, and that you’re monitoring your your finances. But I think that something like this is so much more than you know hoping to make a buck at the end of the day because really we do hope that with any proceeds are going to go to augment the programs that we that we provide or help us to create some new ones. So you’re always conscious of the money. But but I think more so you have to try and find a way to measure those intangible benefits as well. Eric: Yeah, yeah for sure. And I love that you point out the golf director that you have, it sounds to me, is operating as kind of facilitator and making things happen and really being that person that enables employees at the range and Al Condeluci in Episode 006 refers to this person as being the gatekeeper. So it sounds like you’ve got an awesome person that’s helping to facilitate that at the range. Karen: He is fantastic. Can’t say enough. Yeah. Eric: Yeah. So I’m curious, you mentioned customer service so that being a key thing for a lot of businesses especially a business that provides that face to face customer interaction. What are customers, what are golfers saying about us the range now that you’ve been operating in for the last four years? Karen: Well I got to say to be honest we don’t have a lot of competition around us. 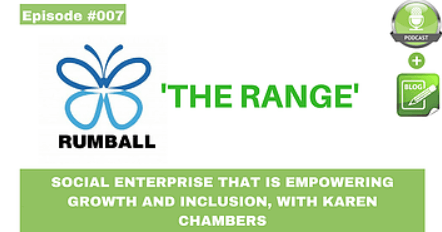 Karen: So that does work in our favour, but anybody that came into the previous business and then came into the new social enterprise, known as the range, has all just been excited to actually understand a little bit more about what happens in our organization and the people that we’re supporting. And you know just to be a part of that and again our director is very well embedded in our community at large. So we have very loyal customers, they’re happy to come, in they’re happy to interact with with our staff, they’re happy to provide opportunity. A lot of things grow out of just that interaction and that knowledge of, ‘hey you know we’ve heard about Bob Rumball but we really don’t know what they do’ you know. So to learn a little bit more about what we do see some of the challenges because I got to tell you almost you know not every day is a good day for our staff at The Range. You know there are some struggles and there are some issues and sometimes our customers are around to witness, you know, some less than perfect moments and but again it really is building an awareness and building that learning. And we have a lot of really good friends and neighbours and a lot of really great customers. Eric: Fantastic. Yes so it sounds like you’re helping to create a more inclusive community as well with that interaction with with your customers which is fantastic. So there’s a second social enterprise that you told me a little bit about. If you’d like, I’d love you to share that with the audience. Karen: I’d be so happy to do so. We’ve been fortunate enough to receive a couple of grants to start up community/ therapeutic gardens initiative. So we do sit on sixty five acres of property here in the lovely town of Milton. Actually we’re right on the border of Halton Hills and Milton. And so we we have been in the planning stages of – geez what do we do with all this property. It is zoned agriculture and my dream is to have a hobby farm. So we’re starting. You know we started with the range we’re now branching out into our our gardens. We started with I think it was three or four garden plots and we’re up to about 15. Again we’ve also invited in our community partners Community Living Burlington, (Community Living) Oakville, Community Living North Halton, some of their people on the property. I am always amazed when I see the things that are coming out of the garden. So we are planning on further expansion with that. The other piece that has branched out from the social enterprise is a landscaping crew that we’ve developed with the skills that we have with a number of homes in the community. So the skills that have been acquired during the our staff time at the range have branched out into this really great little landscaping crew. That does a lot of our properties here and we’re trying to get that going as well to be more instrumental in getting business in the community as well. So yeah we had a lot going. Our garden plots – I think we’re in our third season of that. Our third phase. We’ve had, as I said, a number of grants to sort of get us going there, and we’ve got the design in hand. I think we just got funding for a pollinator garden and we’re making accessible accessible paths through the gardens here. That’s part of the construction that’s going to be going on this year as well. So that’s happening. Eric: Fantastic. I love that. And I love how you’ve opened it up and created some other partnerships, so you know, being inclusive in bringing in Community Living agencies and other folks into the project. That’s fantastic. Karen: When you think about social circles for a for the people we support they they are so small, or can be very small and, for Deaf people it can be even smaller. So to bring people in and give that opportunity for meaningful interaction and employment and volunteer and leisure opportunities that it’s pretty fantastic thing we’re doing it here. 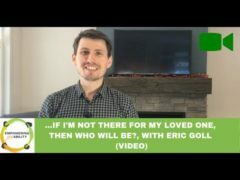 Eric: Yup, increasing an individual’s social capital right and building your social network. Yeah that’s fantastic and it can be one of the things that is overlooked a lot of the time from my experience, so yes I love that. So there is probably more than a couple of listeners that are interested in starting their own social enterprise or have thought about it. What tips or maybe things that you can learn from your experience? What can you share to someone that’s interested in starting or beginning a social enterprise? Karen: I think the biggest thing is finding the right people. As I mentioned before, you’ve got to have some resources to start things up and that could be through a grant that could be through donations. It could be through some of these opportunities with the Ministry of Community and Social Services. The employment modernization fund – I think another round just was approved. Again, you know, a lot of this has to move away from those typical sheltered workshops. So yeah, getting the right people, having some resources, and finding a need and finding a love of, you know, of the people that you support finding what they really want to do with their day, and how they can contribute. Eric: I love it. Follow your heart, really understanding the need of your customer, finding the right people, and then ultimately finding some seed money to get started in your effort – get some grants that are becoming available in Ontario. I’m sure there’s other grants in other parts of the world as well. So. So that’s fantastic Karen. Now if listeners would like to get in touch with you maybe to have a conversation around some of the stuff you do in social enterprise and social innovation, or if people would like to learn about the services that you offer where can they go to do that? Karen: They can certainly Google us at www.bobrumball.org, or certainly pick up the phone at 905-878-4932. And anyone would be happy to, and I’d certainly be happy to see anybody that’s interested in coming out looking at what we do, and passing along some helpful hints if possible. Eric: Awesome. Well thank you for putting that out there for our listeners. And Karen it’s been an honor to have you on the show today, and thank you very much I appreciate it. Karen: Thank you very much. I love the work that you’re doing and I think these podcasts are so helpful for for so many people. So I thank you for that on behalf of the families and the people that we support for sure. Eric: Awesome. I appreciate your kind words. Thanks so much Karen Well we’ll talk to you soon. Eric: I’m grateful for Karen coming on the podcast today and sharing the story of the Bob Rumball Associations for the Deaf. And it was great how she was open to having a conversation on how to best communicate with the folks that are Deaf or Deaf Blind and giving us some tools that for those of us that don’t speak American Sign Language or some of the other languages to to communicate in that manner and really being cognizant of our facial expressions and utilizing things like spread the word app. I thought that was really great. I really also love the story The Range and how the driving range in Milton was converted from a for profit business into a social enterprise and the growth that that’s providing the 12 individuals that work there and the skills and the confidence that that’s that those individuals are able to build. And also how it’s starting to impact the customers and creates a more inclusive community in the area. So I really love that. And a project that’s going on with the community gardens is fantastic and I hope for those of you that are thinking about starting a business in this social space, social enterprise, I hope that Karen’s experience was helpful and gave you some ideas on things to consider when starting up and getting going. That was fantastic. So grateful for Karen to be in the show today and we’re really looking forward to our conversation next week with Danny Steeves. And Danny is an individual with a developmental disability, and Danny is going to join us on the podcast and tell us his story and he’s going to tell us about his story looking for employment in his small town, and his creativity on creating a job opportunity and creating employment for for Danny. So he is a real motivational young guy and we’re excited to have him on on the empowering ability podcast next week. I also encourage you to check out our other podcast that can be found on www.empoweringability.org. We’re also on iTunes so just search empowering ability. And I also welcome you to join our Facebook group so you can find us at. By just searching ‘Empowering Ability’ on Facebook. So thanks for listening today folks and hope to see you next week. Voiceover: Thanks for listening to today’s podcast. Visit us at www.empoweringability.org for more podcasts and resources to help your loved ones, impacted by disability, live a full and meaningful life.